Simba is the main Characters in the movie The Lion King 1. He is the son of Mufasa (the king of pride rock). He was close to his father when he was young. Simba all ways wanted to be just like him, strong, mighty, and to be king. He all ways payed close attention when his dad told him about his job of the king. Simba couldn't wait to be just like his father when he grows up, but one day scar (his uncle), told little Simba that his father going to give his a big surprise, and simba couldn't wait to see what the surprise was, so he listen to scar, and sat at a small rock, and practice his roar, when his father comes to give him his big surprise. Simba did. He roared, and roared, and all of a sudden he saw the rocks on the ground moving a lot, and looked up, and saw a huge herd of waldo beasts. He started running, and scar plan was working to get Simba running from the herd, and he will get Mufasa to try to save little Simba. Scar told Mufasa that his son was running from the big herd. Mufasa saw his son running, and Mufasa started to run for his, and got simba to safety, but Mufasa got taken away from the waldo beasts, but jump to a big rock and climb to his brother scar. Then all Simba saw was his father falling from the rock. He went down to his father, and sadly realized his father was died. Scar told him he should run far way and never come back, and Simba did. Years past, and Simba met two friends Pumba, and Timon. Suddenly he met his best friend Nala when she was trying to kill his two friends, but she never mean to do it by purpose. Nala, and Simba talked, and fell in love, but Nala told Simba about Scar taking over Pride Rock. Simba didn't want to be king even though he said he wasn't to when he was young, but he really didn't because he that he killed his father, and think he should not even try to be king because he thinks his mother would be mad at him, but Nala told simba just try, and he did. Simba met his uncle again, and fought him, but simba all most fell off of pride rock, and scar grabbed Simbas paws with his nails, and told simba he killed his father, an dSimba got mad, and jumped on scar, and beat his, and became the new king of pride Rock. He had a son named Kopa, and a daughter named Kiara. 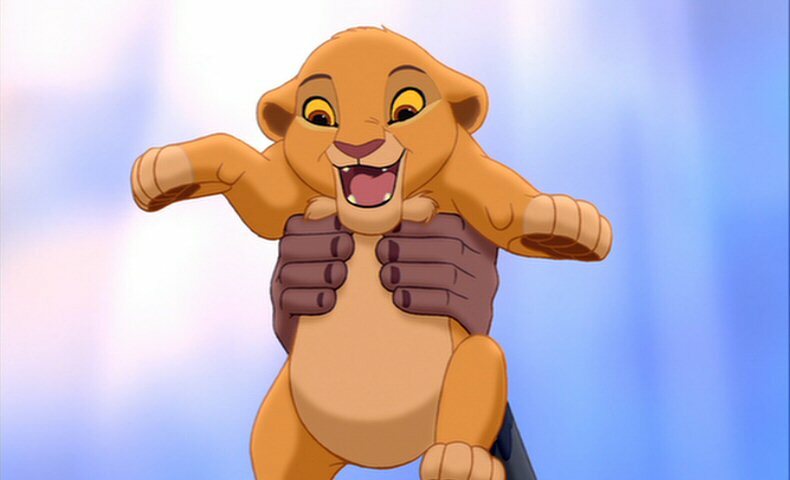 As a cub, Simba is curious, adventurous, cocky, and all too ready to become king. He is known to overstep his authority and attempt to order around the other creatures of Pride Rock. He suffers serious emotional trauma when Scar, his uncle, murders his brother, Simba's father, Mufasa. He didn't know this however, and Scar convinces Simba that he was responsible for his father's death, and tells him to flee from the Pridelands, never to return. Simba naievly shows great trust in his uncle as he runs away from all he's ever known, and he later picks up a happy, carefree lifestyle with Timon and Pumbaa in an idyllic jungle paradise. As an adolescent, he has long since forgotten his old life, and once again acts as over-confident and adventurous as he did as a cub. Later, when Simba learns that Scar is ruling the Pridelands unjustly, he faces his past and returns to take his place as the rightful king. By having the responsibilities of being a king thrust upon him so suddenly, Simba is forced to mature greatly, and in a short space of time. As a father and king, Simba is very over-protective to his daughter, Kiara. He always has someone keep an eye on her and even marks a trail when she ventures alone. This doesn't change when Kiara matures into an adult because Simba breaks a promise to her for the sake of her safety. As a cub, Simba boasted golden-brown fur, as commented upon by Pumbaa. His eyes are orange, his eyeshades are chestnut, his muzzle, underbody, forepaws, and lower eyeshades are light-colored. As an adult, his mane very luxurious, thick and a rich red which looks almsot exactly like his father's. His build is very similar to his father's, but facial feature wise, when compared side-by-side, he looks more like his mother, Sarabi. In the beginning of the first film, Simba is an infant curled up in his mother's paws during the royal ceremony, where all cubs of the king and queen are presented from the summit of Pride Rock. For the ceremony, Rafiki the baboon cracks open a gourd and makes a red mark on Simba's forehead. He sprinkles sand on the newborn's head, causing baby Simba to sneeze. After his anointing, Rafiki picks him up and presents Simba to all the animals in the Pridelands who had gathered to see him. Mufasa showing Simba the kingdom. 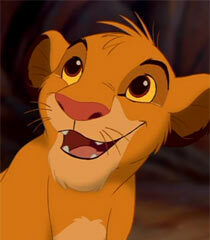 Simba grows into a lively, playful cub. Waking up one morning at dawn, he begs his father to show him the whole kingdom. Simba and his father climb to the top of Pride Rock, where Mufasa explains to his son that everything the light touches is their kingdom, and after his passing, Simba will become the new king. 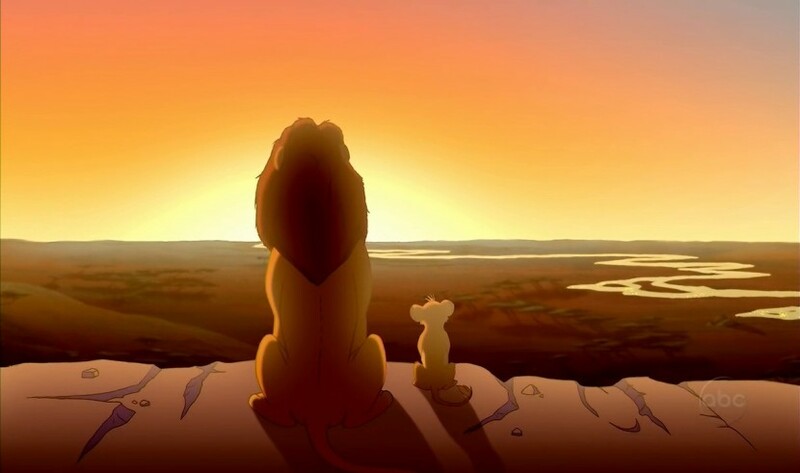 The cub questions the "shadowy place," and Mufasa explains that it is beyond their borders, so he must never go there. As they go on a walk through the Pridelands, Mufasa tells Simba about the "great Circle of Life": that is, that every living thing "from the crawling ant to the leaping antelope" is connected and exists together in a delicate balance. While they are walking, Zazu, Mufasa's majordomo, gives the king the "Morning Report." Simba, bored, tries to practice pouncing. After some instruction from his father, Simba succeeds in pinning down Zazu. As Zazu is on his back, a gopher pops up and tells Zazu and Mufasa there are dangerous hyenas in the Pridelands. Mufasa leaves to deal with the threat, forbidding Simba to come with him. Disappointed, Simba returns to Pride Rock to find his uncle Scar. He gleefully informs Scar that he's will one day be King of Pride Rock, irritating Scar, who unenthusiastically replies, "Yes, well, forgive me for not leaping for joy - bad back you know." and his uncle eventually asks him whether his brother showed him what lies beyond the northern border; Simba admits that he didn't, and Scar acts relieved, saying only the bravest of lions go there. Objecting, Simba says he's brave and demands to know what's there. Accidentally on purpose, Scar lets slip that "an elephant graveyard is no place for a young prince," aware that Simba's curiosity will lead him there. Simba is excited at the prospect of an adventure, but promises his uncle that he won't visit the dreadful place. Instead, Simba goes to his best friend Nala being bathed by her mother, Sarafina, opposite his own mother, Sarabi; Simba tries to get Nala to accompany him somewhere, without giving away the location of their adventure. When asked where they are headed, he lies, "around the waterhole." Sarabi sends Zazu to accompany them, much to their dismay. On the way to the waterhole, Zazu makes a nostalgic comment on how the two are "betrothed, intended, affianced," meaning they are set to be mates and rule the Pridelands, but since they are just children, they find it too weird. The duo manage to ditch Zazu by crushing him with a pile of animals set to Simba singing "I Just Can't Wait to be King." The cubs tumble into the Elephant Graveyard, and after a quick exploration, Zazu catches up with the them before Shenzi, Banzai, and Ed show up. Simba tries to be brave in front of the hyenas, but realizing the danger, the cubs make a frantic effort to escape with the hyenas in hot pursuit. The chase leads to Simba and Nala being cornered in a cave. Simba tries to protect Nala by making a roar to scare the hyenas away, but is unsuccessful. Just then, Mufasa arrives to the cubs' rescue and pins down the hyenas, who escape in fear. 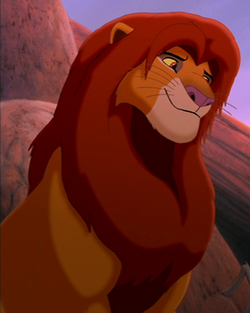 Going back to Pride Rock, Mufasa admonishes Simba, expressing disappointment in him and anger that he has disobeyed him; as Simba says he was trying to be brave like his father,Mufasa explains that even kings get scared, and he was because he almost lost Simba, then Simba jokes that the hyenes were even more scared. After playing together under the sky, Mufasa tells his son something that he once learned from his father, about the "Great Kings of the Past" looking down from the stars, and whenever he feels alone, the stars will always be there to guide him—and so will he. 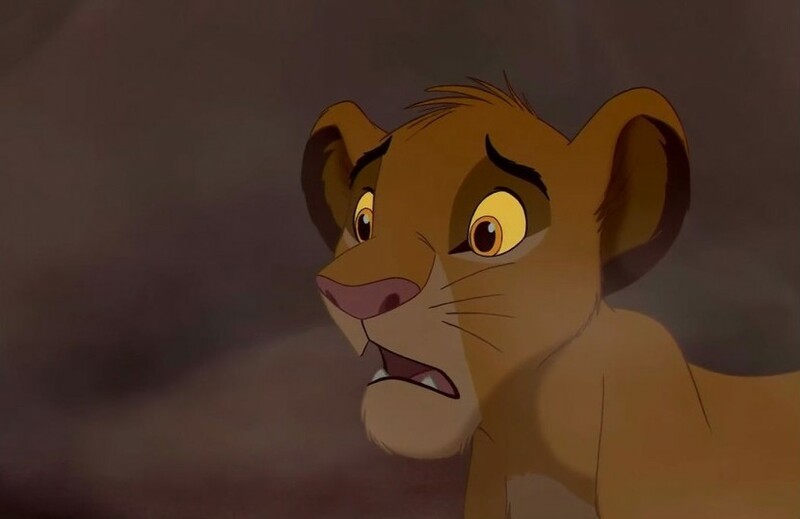 The next day, Scar, who had been plotting to kill his brother and nephew to become king, takes Simba with him to a large gorge, saying his father has a "surprise" for him. 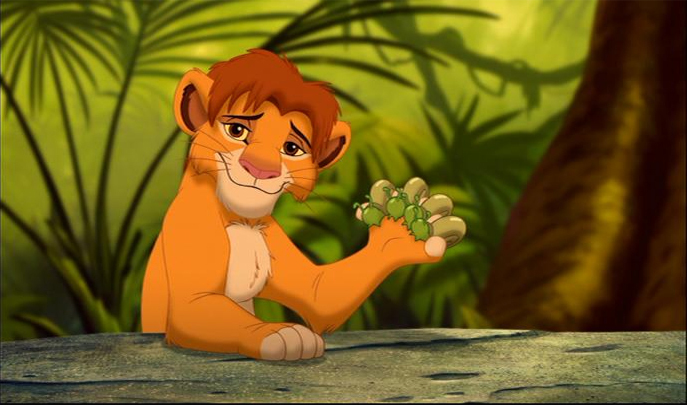 Simba begs his uncle to tell him what it is, but Scar walks away after teasing him about practicing his "little roar." Unknown to Simba, Scar has signaled the hyenas to start a wildebeest stampede to chase the frightened herd down to the gorge below. While the cub practices his roar a little louder than usual, the wildebeest charge down the cliff face in the direction of Simba. Terrified, Simba runs for his life. Meanwhile, Scar runs to Mufasa panting Simba is in the stampede down in the gorge. Immediately, Mufasa rushes to the gorge to save his son, who desperately manages to jump and cling on to a branch while the wildebeests thunder below him. While Mufasa fights through the stampede, one of wildebeests collides with the branch and breaks it, sending Simba flying into the air. Mufasa leaps to catch his son, but drops him upon impact with one of the wildebeests. Becoming stuck in the stampede again, Simba dodges a few wildebeests before again being picked up by Mufasa, who then gets him to safety. Pulled back ito the herd, the alpha lion fights and struggles and throws himself on to the ledge, clinging on for dear life. Seeing this, Simba runs to the top of the cliff. As he reaches the top, all he sees is his father plummet into the stampede below, not knowing he was just thrown by Scar. He cries out and races down to the bottom of the gorge to find his father's body under the branch he was clinging to. Hoping that his father isn't dead, he tries to revive him. Realizing that Mufasa is neither moving nor breathing, he calls for help, but starts to cry and crawls under his father's fore paw. Scar approaches and manipulates him into believing that he is responsible for the death of his father, since his roar has triggered the stampede, even though Scar really caused it. When asked what his mother would think, Simba doesn't know what to do, so Scar tells him to run away and never return. Scampering away, Scar sends Shenzi, Banzai, and Ed once again to kill Simba. Panicked, scared, and now chased by the hyenas, he runs on some rocks up the gorge and comes out at the top of a steep cliff. With a patch of sharp thorns below, Simba has no choice but to jump down the cliff to escape the predators. He tumbles down and forces himself through, but the hyenas don't follow, thinking Simba is as good as dead out in the barren desert anyway. Tired and dehydrated, Simba wanders into the desert; in the burning heat, he eventually faints. Waiting for him to die, vultures circle overhead, but a meerkat named Timon and a warthog named Pumbaa scare away the vultures and save the unconscious cub. They revive him and ask him if he's okay. He shakily replies, then starts to wander off; the two ask what he did, but Simba doesn't want to talk about it. Timon and Pumbaa take the cub into a jungle to teach him to forget the past and live by "Hakuna Matata," meaning "no worries." During the song "Hakuna Matata," Timon and Pumbaa have Simba eat bugs, explore his new home, and live without worry. The three walk across a log, which represents time elapse of a few years, during which Simba transitions from a cub to a teenager to an adult. 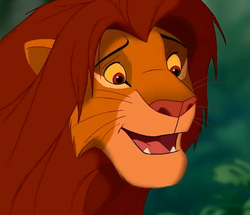 A teenaged Simba appears briefly during the log sequence during the song, "Hakuna Matata". Simba is older than his adolescent counterpart seen in The Lion King 1½, evident by the mane that begins to run down his neck, and the mane that begins appearing on his chest and lower body. Originally, teenage Simba was to have more screen time, evident by the concept art to your left. 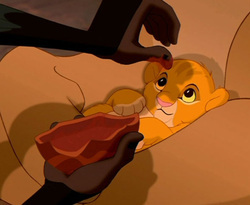 This scene is included in the final movie in a sense, but when we see it Simba is an adult, not a teenager. Simba is now an adolescent lion, who seems to beat Timon and Pumbaa at all kinds of alliterative bug eating contests, including the longest bug belch, slug swallowing, cricket crunching, grub gulping, maggot munching, as well as the snail slurping contest shown in the film. He has grown a small mane on his head and looks even more hot-headed than as a cub. After some years pass, Simba has now grown to an full adult lion who enjoys his life with Timon and Pumbaa in the jungle. Simba had an interesting conversation with Pumbaa about dung beetles before Nala appears and chases Pumbaa, causing Simba to attack her; he later realizes it's his old childhood friend. Growing up in the jungle, Simba learns to be carefree and forget all about his responsibilities. Although happy in the jungle, he feels homesick when stargazing with his friends, recalling what his father told him years ago when they looked up at the stars together. He gets more upset when Timon's comments mock the Great Kings of the Past. Simba leaves to flop down on the rock, wishing his father was still alive. A few days later, Simba hears Timon and Pumbaa crying for help in the jungle and immediately rushes to their rescue, finding himself face-to-face with a hungry lioness. After wrestling with the lioness, she flips Simba onto his back, a move he recognizes from Nala. When he mentions Nala's name, the lioness becomes surprised and backs away. When she asks who he is, Simba tells her his name, and the lioness is surprised to realize it is him. As they rejoice, Simba introduces Nala to his new friends and Nala tells Simba that he's the rightful King. Simba rejects his responsibility and refuses to go back, still believing that he was he was guilty of killing his father; still, he comforts Nala as she struggles with the reality of him being alive after all those years. Enjoying a peaceful sunset evening together, playing "Can You Feel the Love Tonight," the two lions realize their childhood friendship has now blossomed into a romantic relationship. However that evening, Nala tries to explain to Simba the fate of the Pridelands under Scar's reign and persuade him to go back, but he refuses, which leads to an argument. Simba marches away from Nala and, alone in a grassy field, yells to the sky how his father is not there for him when he said he will, and Simba labels the blame on himself. Soon, Simba notices Rafiki singing in a tree. Trying to get away from him, Simba goes to lie down away from the mandrill; Rafiki, the same one from Simba's birth ceremony years ago, refuses to leave him alone, so Simba asks who he is. Simba doesn't know anymore, and after Rafiki chants in his ear, he says that Simba is Mufasa's boy. Surprised to hear his father's name, Simba chases the wise baboon and asks if he knew his father, but Rafiki says he knows his father, and explains to Simba that he is still alive. Rafiki leads Simba to the stream, and as Simba remarks that he only sees his reflection, Rafiki tells Simba to look harder as Simba's reflection becomes the face of Mufasa. At the same time, he hears his father calling to him from the sky, and Simba looks up to see him again. Mufasa's spirit appears in the sky, which Simba recognizes, but Mufasa accuses his son of forgetting him, to which Simba denies. His father says Simba has forgotten his father and his own place in the Circle of Life. He reminds Simba that he is his son and the one true King, before telling him to "remember." Simba chases his father's disappearing form in the sky. Rafiki approaches Simba again and listens to him discussing how he will have to face the past, from which he has ran away from, if he is to return. Rafiki then whacks him on the head with his stick and teaches him the lesson that even though things are in the past, they can still hurt, but he should learn from them. As Rafiki swings his stick again, this time, Simba dodges Rafiki's whack. Simba snatches Rafiki's stick and leaves to take back his place as king of the Pride Lands. Arriving back at his home land, he is shocked at the dry, barren condition the the once green and fertile land has fallen into. As Simba trudges through the Pride Lands, Nala, Timon, and Pumbaa catch up to help him fight Scar. As they make their way to Pride Rock, they find they way blocked by hyenas, and Simba instructs Timon and Pumbaa divert the hyenas so he and Nala can slip past. Simba then tells Nala to look for his mother Sarabi and rally the lionesses and searches for Scar. 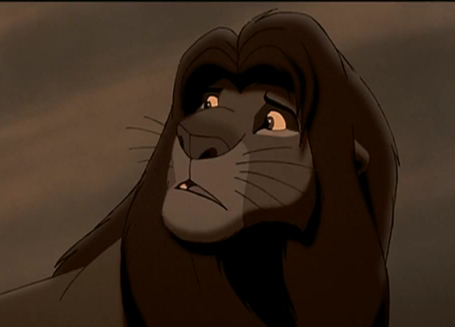 He freezes in horror as he hears his mother's name yelled out by Scar, then watches as Sarabi and Scar argue. Upon seeing his mother getting struck down by Scar, Simba's anger mounts, then he runs out of hiding to her side. At first, Sarabi mistakes him for Mufasa, but she eventually realizes it is her son. Simba then confronts his uncle, demanding to step down from his position or fight, to which Scar softly refuses. Feeling trapped, Scar then resorts to accusing Simba of killing Mufasa, and Simba doesn't deny it. With Nala and the other lionesses watching, Scar corners Simba on the edge of Pride Rock's promontory. As Simba slips from the edge, lightning starts a fire below. 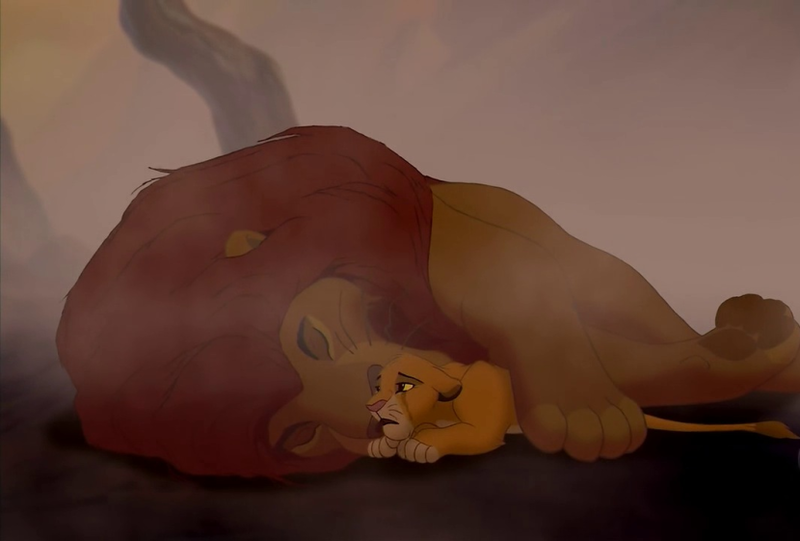 While Simba clings onto the edge desperately for life, Scar remembers seeing Mufasa in a similar way before his death. Scar latches his paws into Simba's and whispers into his ear that he, Scar, is the one who killed Mufasa. Filled with rage, Simba leaps from the edge and pins Scar to the ground. Simba forces his uncle to confess out loud, leading to a tremendous battle. The hyenas ambush Simba, prompting Nala, the other lionesses, Timon, and Pumbaa to charge in and wipe out the hyenas. Simba then chases his uncle to the summit of Pride Rock, where he finally corners Scar. 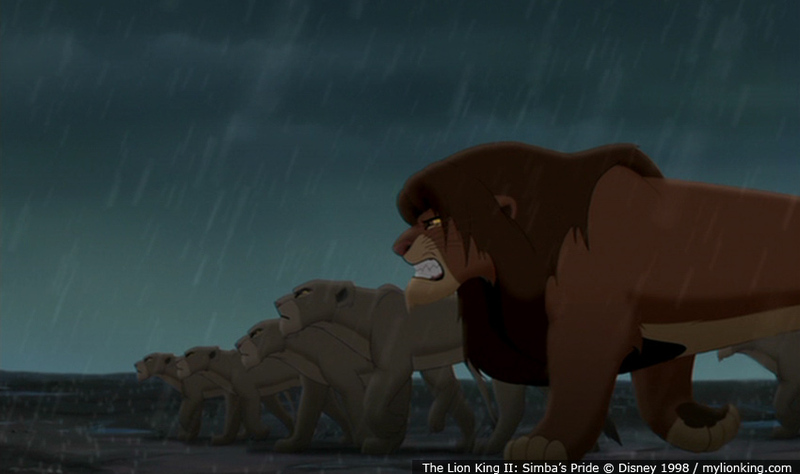 Scar pleads for mercy as he puts the blame the hyenas, unaware that they turn away in disgust and anger. Fed up with all the lies his uncle has told him, Simba chooses not to kill Scar, but spares him by repeating the words that his uncle has previously told him: "Run. Run away, Scar; and never return." Scar begins to slip away, but suddenly turns around and throws burning embers into Simba's eyes. The two lions fight ferociously, until Scar delivers a hard smack that knocks Simba to the ground. As Scar leaps to finish Simba off, Simba uses Nala's fighting tactics to flip Scar over the edge, sending him tumbling down the ledge. Simba looks down and watches as the hyenas jump on his uncle and chow down on him. After rain falls on the Pride Lands and extinguishes the fire, Simba walks down to greet his mother, Zazu, Timon, Pumbaa, Nala, and the rest of the pride. Rafiki rattles his stick to get Simba's attention and motions for him to ascend Pride Rock. Simba then walks over to Rafiki, and as Rafiki bows down to him, Simba embraces him before Rafiki tells him "It is time." Simba then climbs up Pride Rock and as he reaches the promontory, he looks at the hole through the rain clouds to see a patch of stars, one of them shining brightly. Upon hearing his father's voice telling him to "remember," Simba gains confidence and strength, then he roars out over his kingdom, and the rest of the pride roar back in approval of their new king. Sometime later, when the Pride Lands have grown back green, Simba and Nala, along with Timon and Pumbaa, stand on the promontory of Pride Rock, proudly looking at the animals who have assembled below. 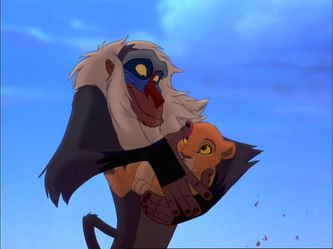 Rafiki then comes in, cradling their newborn cub in his arms, and he lifts the cub up for all the animals to see. Seasons later, all the animals, including giraffes, elephants, gazelles, and other African wildlife in the savannah, return to Pride Rock to welcome the birth of Simba and Nala's daughter, Kiara. The king and queen look on proudly as Rafiki holds their cub up for all of the kingdom to see, just as Mufasa and Sarabi, did when Simba himself was born. As Kiara grows up, Simba turns out to be extremely over-protective of her. One time when Kiara goes off to play, he warns her to stay away from the Outlands and to stay on the path he's marked for her. He is really over protective of her because of his lost son Kopa. He would not want to loss an other cub. After he realizes that Kiara has sneaked away from her babysitters, he, along with Nala, Pumbaa, Timon, and the some of the pridelanders, goes out for her, finding her near the outskirts of the Outlands with a Outsider cub, Kovu. He jumps in front of Kiara, protecting her; at the same time, Zira launches herself in front of her son. Simba snarls at her, and Zira mockingly gives cover-up for punishment for straying into the Pride Lands. Simba growls at her, "Take him and get out—We're finished here." Zira laughs menacingly, and replies, "Oh no, Simba; we have barely begun!" Simba takes Kiara and walks away. Simba reminds Kiara that she has got to be Queen, even though she may not want to be; he reminds her of the "Great Circle of Life." He tells her that they are part of each other, and sings to her that they are "one." Years later on (Kiara's first hunt), Kiara pleads with her father to let her hunt on her own. Simba promises, but once again, sends Timon and Pumbaa to watch her anyway. A few hours later, Simba paces nervously on Pride Rock, where Zazu reassures him that Kiara will be fine. Suddenly, Simba notices smoke on the horizon as Zira's plan goes into action. He and Nala races to Kiara, only to find her talking to Kovu. Simba is roaring menacingly at Kovu, as Kiara reminds how he has broken the promise her father had made on letting her hunt on his own, to which Simba, out of fear of losing her again, forbids any more hunting lessons for her. Just then, Rafiki appears and brings up the fact that Kovu saved his daughter's life. When Simba asks him why, Kovu asks to join his pride. Simba initially refuses; but Zazu tells him that his father, Mufasa's law demands all debts be paid. In repayment for his daughter's life, Simba reluctantly lets Kovu join the pride on judgment, but doesn't allow him to sleep with the pride. That night, Simba has a dream similar to the scenario in which his father was killed by Scar in the wildebeest stampede. In the dream, Simba tries to save his father, who is hanging on a cliff face. 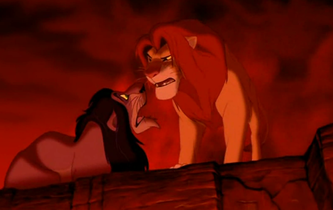 As he reaches down, he realizes that he is also on the cliff face, and Scar is looking over him as Scar grabs his paw. Mufasa slips away. However, Simba looks up to see Kovu instead of Scar; then Kovu lets Simba fall, and he wakes up out of his dream. The next morning, Simba has a drink at the waterhole. Unknown to him, Kovu is behind him, ready to kill. Luckily, Kiara turns up wanting her hunting lesson, so Kovu is drawn away. That night, Simba looks down on Kiara and Kovu stargazing together, and asks his father for guidance. Nala then walks beside him and tells him to trust Kovu more. That evening, Simba lets Kovu sleep with the other lions in the cave as it is a fairly cold night. The next morning, Simba asks Kovu to walk with him. He explains to Kovu his side of the story about Scar. As they are walking, Zira and the other Outsiders surround them. Simba angrily snarls at Kovu, thinking he is behind the plan, to which Kovu denies. The Outsiders close in around him throw them off. He runs into a gorge and climbs up the dam. Just as he's climbing, Nuka grabs his ankles, pulling him down. Simba pushes himself up, dislodging a log which tumbles down and crushes Nuka to death. Simba escapes and weakly makes his way back to the pridelands, where he manages to whisper to Kiara, Pumbaa, and Timon what happened, before collapsing. They help him back to Pride Rock, where he recovers. When Kovu returns, Simba confronts him, asking the reason why he came back. 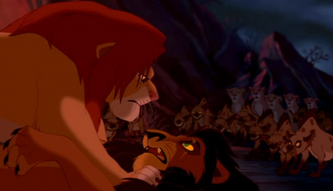 Kovu asks for forgiveness, but Simba does not believe Kovu has had nothing to do with the attack. Kiara tries to persuade her father to listen to Kovu, but Simba exiles Kovu, to Kiara's heartbreak. Kiara then quarrel with her father, pleading him to reconsider, but he refuses, saying he knows Kovu is following in Scar's pawprints, and that he must follow in his father's. Kiara then angrily yells at him, "You will never be Mufasa!" This comment hurts Simba immensely. That night, the rain falls down, and Simba asks Timon and Pumbaa where Kiara is. Just as he finds out she is missing, Zazu informs him the Outsiders are on the attack. 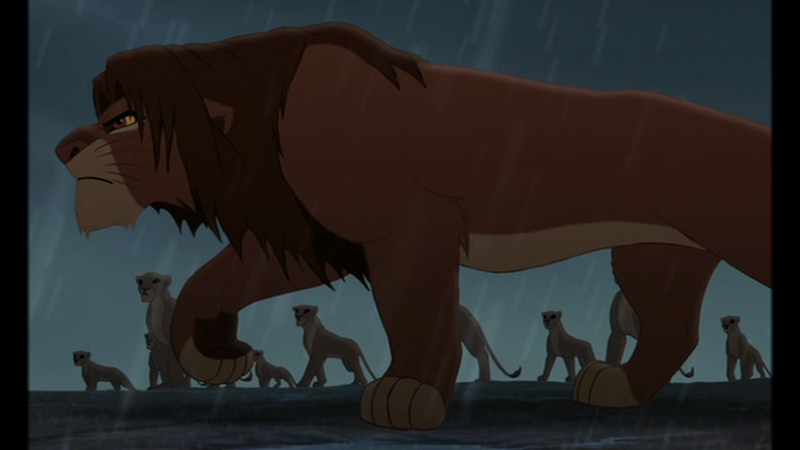 He commands Zazu to find Kiara and assembles the lionesses, ready for battle. When they approach the Outsiders, Simba gives Zira a final chance to go home. Zira tells Simba that she is already home, and commands her troops to attack.. After a bitter battle, Zira jumps down off her rock, ready to attack Simba herself. Just as they are about to go into a one-on-one combat, Kiara jumps in front of her father, and Kovu jumps in front of Zira. Simba tells his daughter to stay out, but Kiara tells him that the fight has to stop. Concurrently, Zira tells Kovu to move and Kovu tells Zira that he won't let her hurt Kiara or Simba. Kiara reminds Simba that they are "one," and asks if he sees any differences between his pride and the Outsiders. As Simba realizes his daughter's words, rain stops and his father shines down from the clouds, then he nuzzles his daughter as they reconcile. Zira orders her daughter Vitani to attack Simba; She refuses to do so, and crosses onto his side as do the rest of the outsiders. Zira, realising she's losing, attempts one more time to attack Simba; but as she jumps for him, Kiara jumps in her way. Shocked, Simba jumps down after them, just as Zira slips away into the water below. Simba reaches his daughter and helps her back up the cliff, where a worried Nala is waiting. When Kiara is reunited with Kovu, Simba studies him and apologizes to him as he finally admits he was wrong. He accepts Kovu and the Outsiders into his pride and they all go home together. 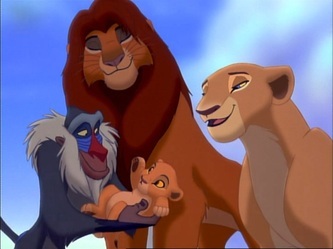 Back at Pride Rock, Simba, Nala, and all the other lionesses watch as Rafiki blesses the union of Kovu and Kiara. Simba, Nala, and the new couple Kovu and Kiara make their way to the top of Pride Rock and roar over their kingdom, with the rest of the pride roaring back in reply. As Simba looks down proudly at the rejoicing animals who have gathered around Pride Rock, the sky opens up, and Simba hears Mufasa say, "Well done, my son. We are one."